We have supplied additional heaters at point of use for those areas in the building experiencing the coolest temperatures. Additionally, Facilities asks that occupants leave their lights on and computers running this week, which will also help with temperature levels. The drilled piers to support the seismic towers are moving along at a great pace, currently averaging just over two a day which puts them on or slightly ahead of schedule for completion. 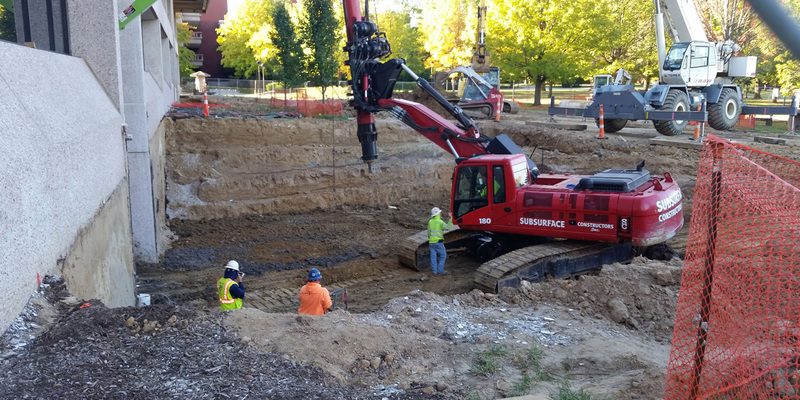 The southeast stair tower is halfway down, and excavation for the northwest tower continues. Inside, most of the second and third floors are gutted. Emergency Management and Safety and Farmer Environmental Services, LLC, are continuing to conduct air quality in the building. Results from the air testing completed by Farmer Environmental Services for Carbon Monoxide, Carbon Dioxide, and total volatile organic compounds (VOCs) fell well below safety standards set by OSHA. Hydrogen Sulfide and LEL (combustibles) were not present at the time of testing. Oxygen levels were found to be normal. Facilities intends to retest these again as the project progresses and new materials enter the building. Testing for Formaldehyde has been contracted through Farmer. This test will be completed tomorrow, with results in approximately 10 days. Additional testing for Silica is currently be conducted by the contractor, with results by the end of the week. It should also be stated that outdoor particulates tested during this period were as much as five times the indoor levels. Additionally, those three locations that tested above our screening standard of 10,000 all returned to levels below 10,000 ppm on retest, and none are permanently occupied spaces. We will continue to monitor the levels, and address any negative trends as they arise. However, with the completion of the barrier to the second and third floors in the atrium, we anticipate levels to remain low. Heat crossover will be complete. Construction on the drilled piers will continue and the southwest corner pier drilling is anticipated to be complete. Demolition of the rest of the Southeast corner stairwell be complete.